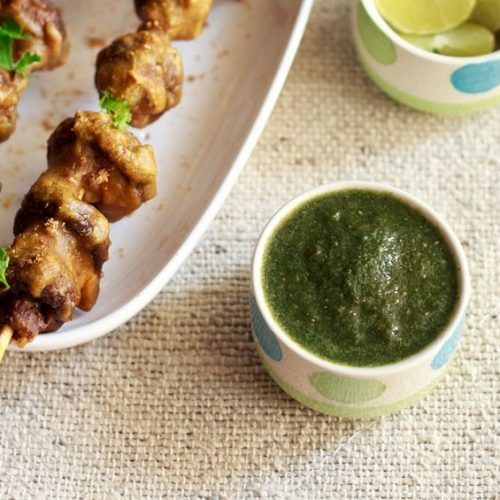 punjabi style green chutney - tangy and strongly flavored chutney. ½ teaspoon dry pomegranate seeds (anardana) - substitute dry mango powder (amchur) or lemon juice or raw mango instead of dry pomegranate seeds. adjust accordingly. rinse and chop the mint and coriander leaves. peel and rinse the onion. chop roughly. rinse and chop the tomatoes roughly. rinse and peel the radish. chop the radish. add these veggies, ginger, garlic in a chutney grinder or small blender. also add all pomegranate seeds, salt, green chilies. add 1 or 2 tbsp water and grind the ingredients till smooth.